1. 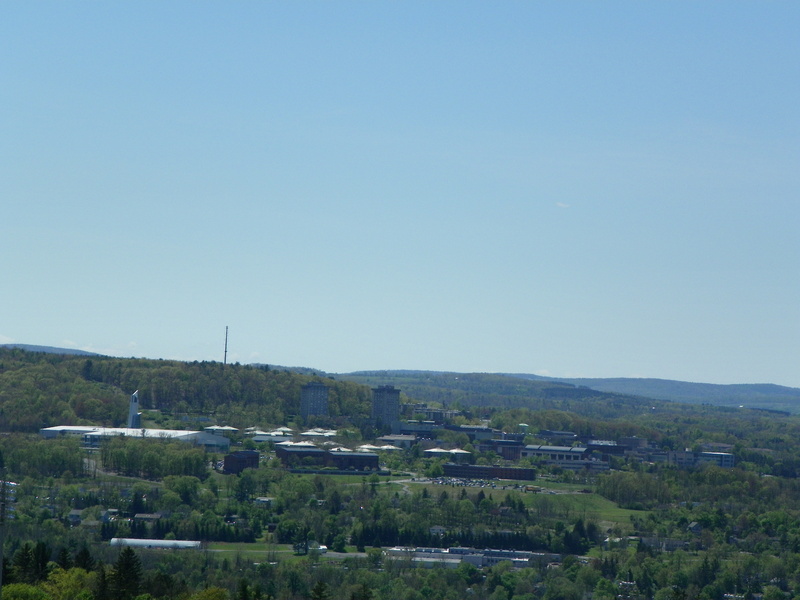 Starting things off, here’s an update on Ithaca College’s Master Plan-in-progress, courtesy of the Ithacan. According to a presentation given by representatives of lead planning firm Perkins Eastman, the master plan will include a climate-controlled walkway connecting several buildings from the Gannett Library through the Center for Health Sciences, the removal of the upper and lower dorm quads and replacing them with academic lab/research space, an amphitheater just below the Dillingham Center fountain and a new entrance on Danby Road closer to Ithaca’s downtown. Now, before residents in South Hill begin to panic that their neighborhood is about to be invaded by students displaced by IC’s decreased housing, I’d like to point out that master plans are rarely built out as designed, but are great for identifying academic needs. I don’t imagine that IC will start tearing down 11 buildings and 1,235 beds unless they really feel like getting into a fight with the town, or throwing up temp housing, neither of which ranks high on the to-do list. At least I get something to write about for a week or two when the new plan comes out this Spring. 2. What is known about Manos Diner’s future occupant: They’re leasing the space from Bill Manos, not buying. It’s a restaurant with owners who already own several restaurants, all outside NYS. It’s not necessarily a chain. It’s apparently a family operation and the food will be Mexican. And whoever it is must have really, really wanted to pry their way into the Ithaca market. I don’t see why they wouldn’t have chosen any number of other sites they could renovate…it seems really strange that an offer so fortuitous would come up that Manos would close his diner with hardly a notice to his employees (which is completely tasteless, for the record). New restaurants in Ithaca aren’t usually big news-makers by themselves, but the entry of this Manos replacement draws more questions than answers. 3. 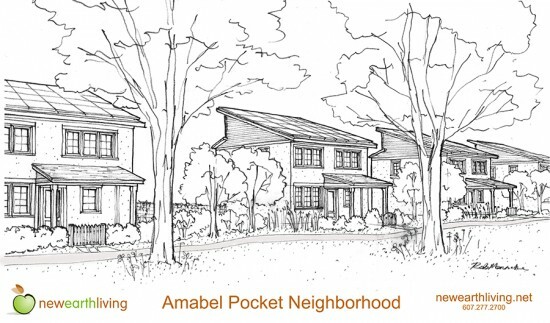 Looks like New Earth Living LLC has released some updated site plans and sketches of their approved Amabel project just southwest of the Ithaca city-town line. 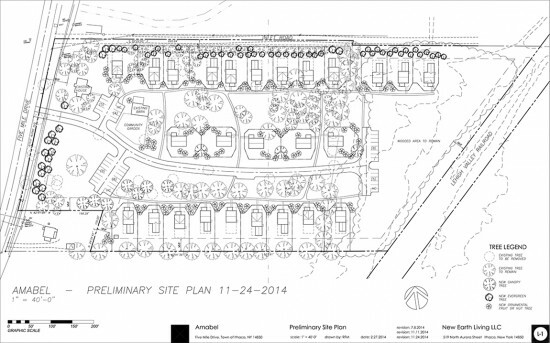 The houses on the northern two-thirds have been rearranged from the previous site plan, and if it’s still 31 units, then the center buildings must be two-family houses. I’ve been told that there will be six different house designs available, so don’t expect all the houses to look the same as in the concept sketch. One thing that the all designs will share are roof configurations that will allow enough solar panels to result in net zero energy use for each home. The city has approved the sale of its surplus land to the developer, and this project is due to start marketing in summer 2015. 4. Here’s a map, courtesy of real estate website Zillow, that prices out how much it would take to afford the median rent in a given metropolitan area, if paying no more than 30% of monthly income to rent (the federal affordable housing standard). Ithaca/Tompkins County comes in at $32.74 an hour, assuming a 40-hour week and 50-weeks working in a year. In other words, $65,480 ($1,637/month average rent). The number is skewed high from the number of expensive multi-bedroom units in Collegetown, but it’s still high when compared to Elmira ($28.08) or Syracuse ($27.74). For comparison’s sake to Ithaca-type communities, Boulder ($41.72) and Ann Arbor ($34.28) are higher, Charlottesville ($29.24), Madison ($27.54) and Asheville ($22.98) are lower. 5. 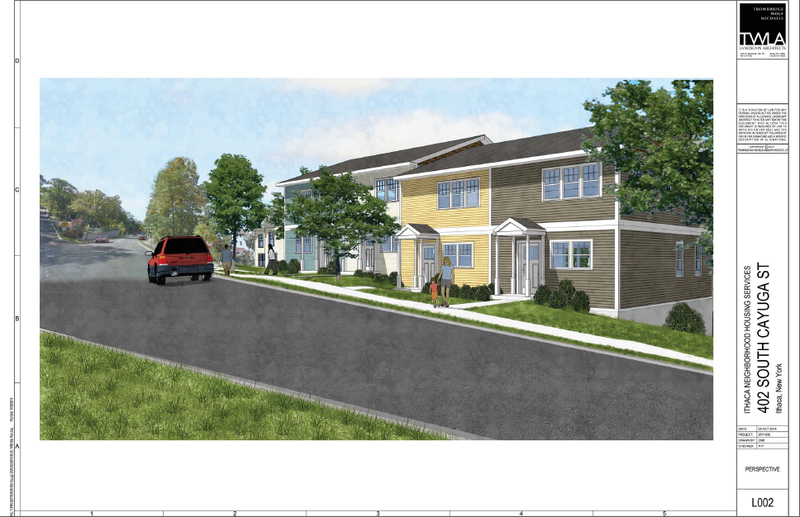 Would you believe this is actually the first render I’ve ever seen for the Village Solars project in Lansing? This comes courtesy of their Craigslist ads. 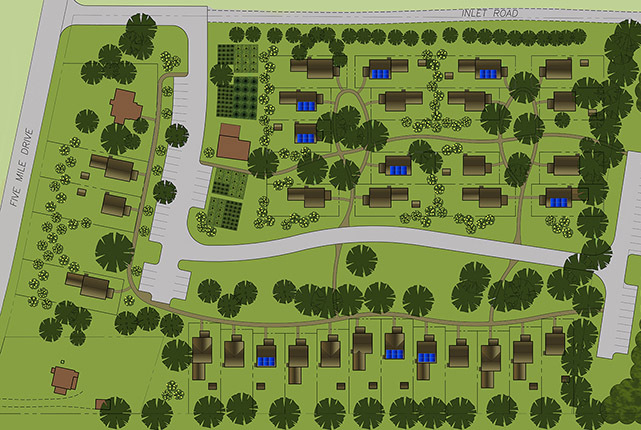 The Village Solars take their name from being designed with passive solar design with large amounts of natural light; I don’t know if they will have solar panels. For being a large project, this one has sailed under just about everyone’s radar, partially because it was approved 18 months before construction started. Since there has been so little news about this project, info comes in the form of government and business memos. Depending on the source, final build-out is between 292 and 320 units, which is enormous for the Ithaca area. Rent’s not cheap with these new units – the minimum is $1235 for a first-floor 2-bedroom, going up to $1369 for a “penthouse” third floor 2-bedroom unit. 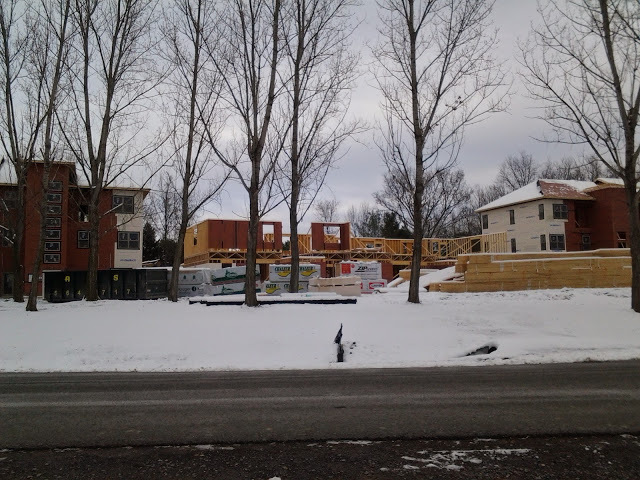 The Craigslist ad says the first units (36 of them) will be ready for occupancy by March 1st 2015. 6. 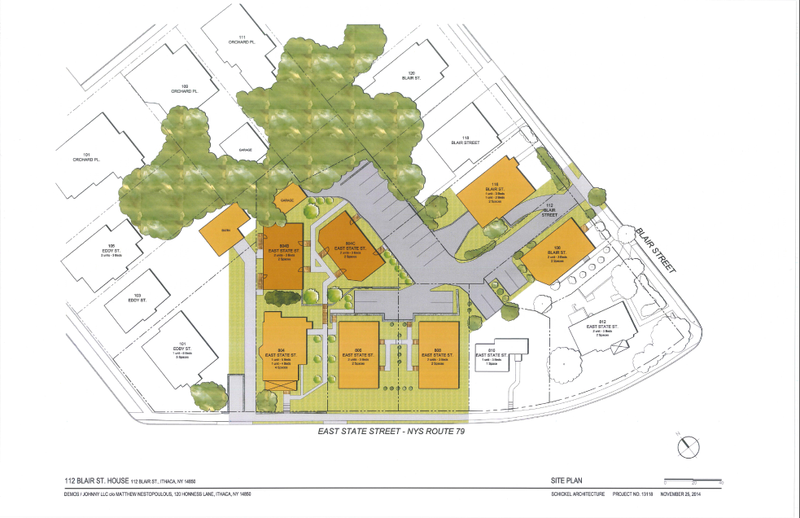 Updated doc and drawings for INHS’s 402 South Cayuga Street have been filed with the city. Application, FEAF and project description here, drawings here. According to the docs, the cost of construction will be $740,000 for the four units, and go from Spring 2015 to Spring 2016 (March 2016 in the FEAF). Some slight metal pollution from Emerson/Morse Chain has been noted in soil tests from below the foundation area, due to the Morse Chain subterranean pollution plume (metals, VOCs) that affects much of South Hill. Although the DEC requires no further action at this time, there will be an active sub-slab depressurization system in place as a safeguard. In other words, a fan blows air into the basement, and it gets vented back out. 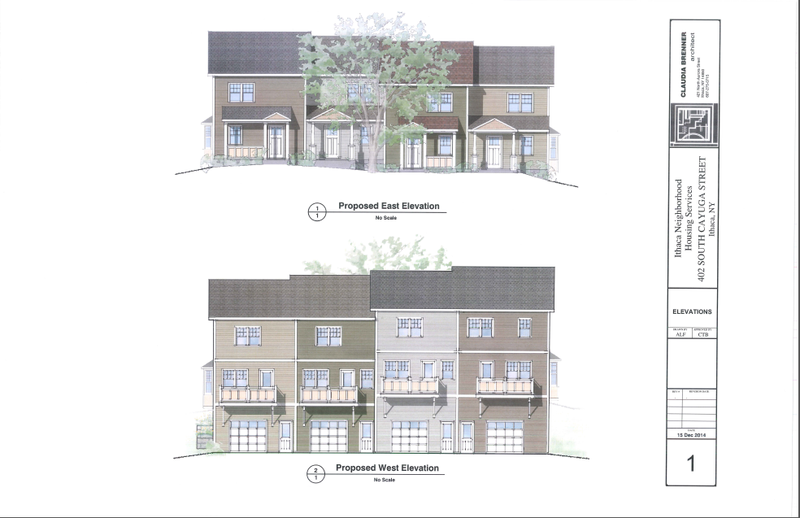 The design of the townhomes has been revised by architect Claudia Brenner to include more architectural detail – bay windows on the north and south ends, and larger/full porches vs. the stoops of the previous design. The siding has also been changed to all earth-tones. It’s an improvement, but I’d rather see two separate windows above the porches. This project will be presented at the January Planning Board meeting. 7. 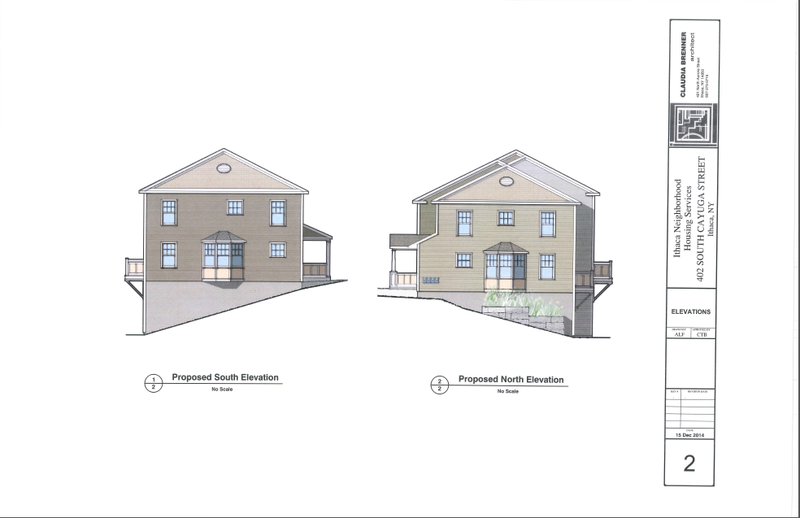 Here are some drawings for 707 E. Seneca. Readers might remember this is the 6-unit building proposed by Todd Fox for a derelict playground recently sold off by the city. 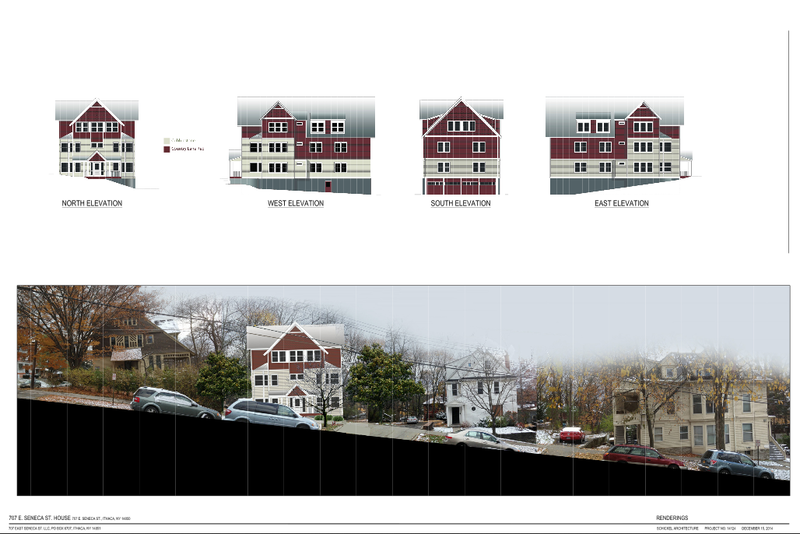 The 18-bedroom design by local firm Schickel Architecture has already been critiqued thoroughly by the Ithaca Landmarks Preservation Council, since the site is within a historic district and needs to look the part. I’d say that they’ve done well, it’s a bit bulky but otherwise a tasteful addition. An area variance will be required from the Board of Zoning Appeals. Construction is expected to cost $220,000 and run from April to July 2015. For more info, the application is here, drawings here. 8. 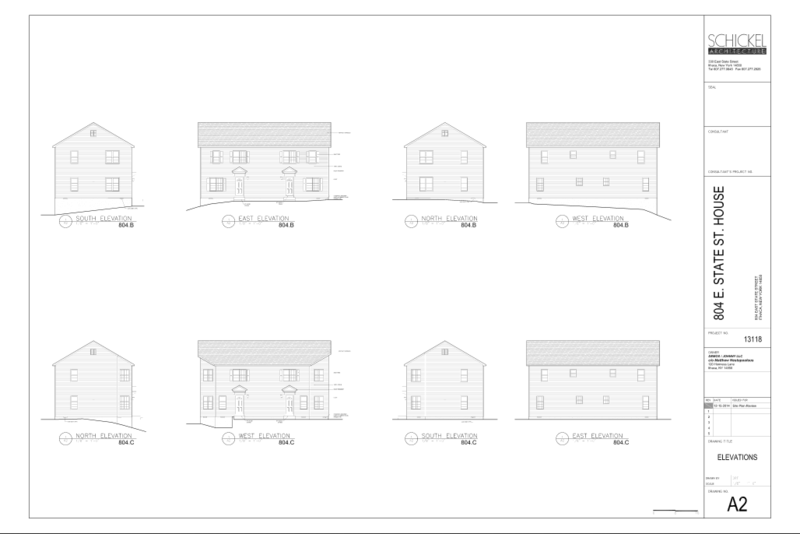 Since we’re talking about East Hill housing, here‘s the project application and here are the drawings for the duplexes proposed for the parking lot at 112 Blair Street. The Blair Street site will be combined with 804 East State Street, and the duplexes will have State Street addresses. The spartan design of these buildings is also by Schickel Architecture, and will add 12 bedrooms in 4 units. Cost is estimated at $213,000 and construction will start in April for a summer completion. The developer is Matthew Nestopoulos.